Habamania.com is fan site for the Montreal Canadiens, the greatest team in the NHL. As the only team with over 12 Stanley Cups, 24 to be exact, they deserve the best. So we gave them the best, with a website dedicated to their fans that gives it all. We provide for you information about how they are doing, what needs to be improved and what is perfect. 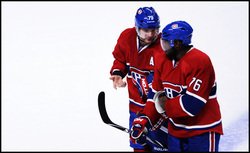 Also, the entire roster of players and staff, up-to-date standings, and history on the Habs. If you sign up for a free membership as shown below, you get even more perks! Such as seeing exclusive videos, access to extras, and you can participate in the blog! Sign up today, and tell your friends! Habamania.com Shop temporarily on the Living The Team website. Jacob Ancri has been a Canadiens fan since the 2010 run to the Conference Finals, and has been a die hard ever since. He's watched over 200 Habs games since 2010 and can name all players and dozens of stats about many players. Living in enemy territory of Boston, he gets a hard time every loss (which is not that often) and is forced into betting on every Canadiens vs Bruins game. Jacob is a goaltender for the Boston Stars 2000 Elite hockey club in New England. This is a Tier 1 team that is on a three year championship streak with his age group. His greatest accomplishments have been coming in fifth place at the TD Garden Mini 1-on-1, even getting to air during a Canadiens win versus the Bruins, and playing goalie against the 2000 Russian National Team that had Andrei Markov's son on the team, in Montreal! He was even in attendance, and Jacob can proudly say he stopped all of his shots. Your personal information will not be sold or published.